Opinion has been divided at Chez Muddy, and frankly in my own head, over the project, as it has been in Brighton itself. 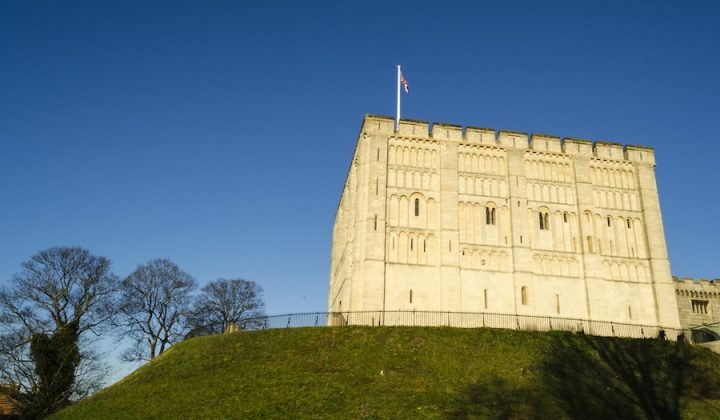 Is it a great thing for tourism or a bit of an eyesore? Does it spoil the heritage look of Regency Square or did the boat sail on that when they put an underground car park in? 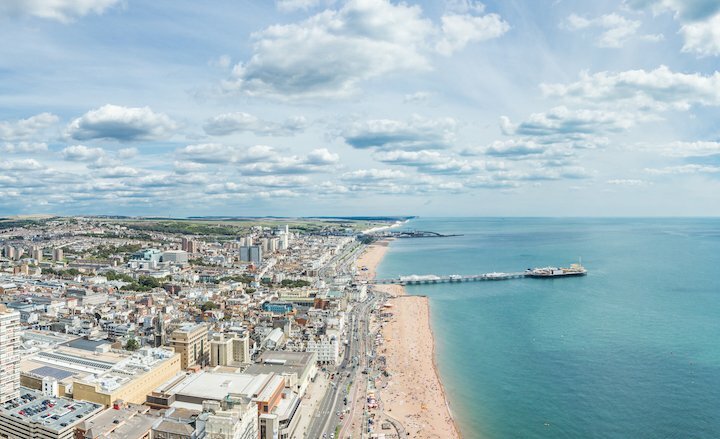 Is it going to be fun seeing Brighton from the air, or is it just a load of sea and mostly ordinary buildings? 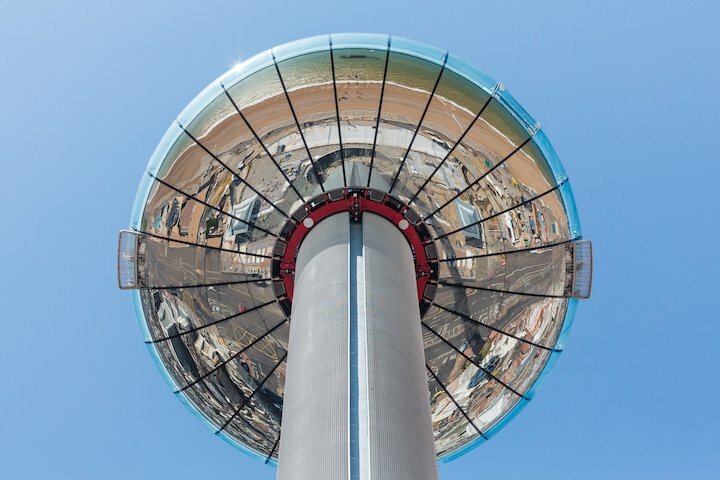 There’s no denying though, there’s quite a buzz about it with plenty of chat around the city over recent weeks about who’s seen it move and how you can get a great selfie using the shiny underside of the capsule. When we actually took off (which was so smooth I didn’t at first notice) people on the seafront did double takes, waved and started snapping us on their phones. 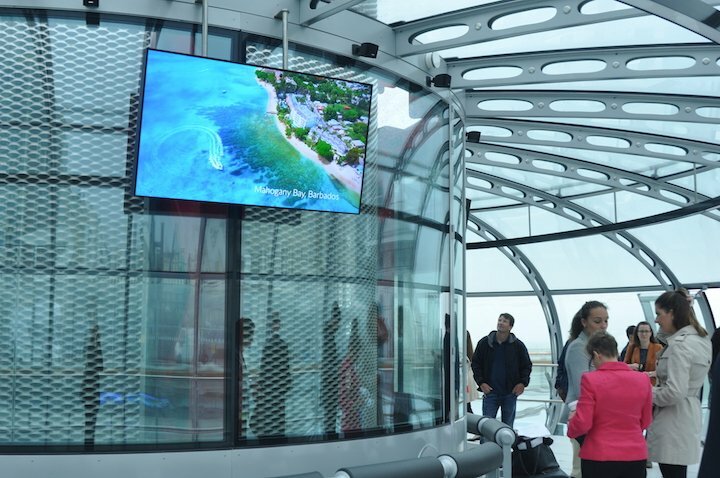 The first thing I thought on entering the capsule was how like the London Eye it looked. 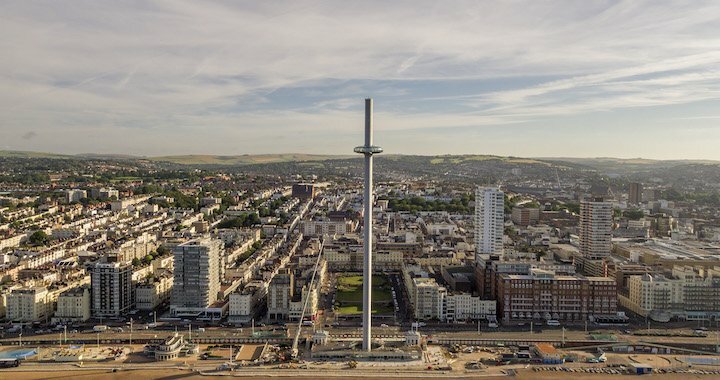 That’s unsurprising; the i360 was designed by the same architects. The capsules are much bigger however and can hold up to 200 people at a time. 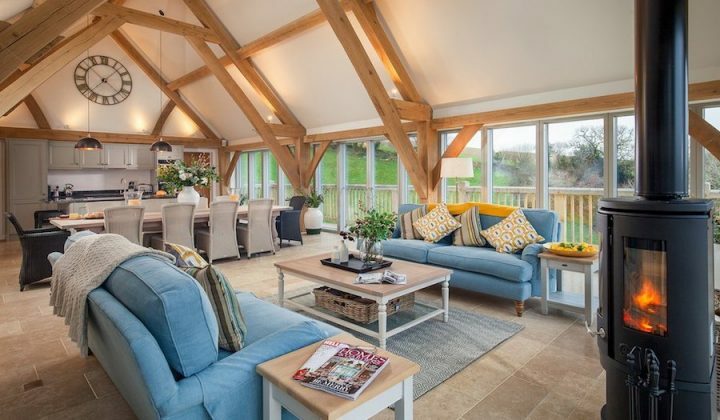 There’s certainly more room to move around, there’s also padded seating all round the centre (handy if, like my husband on the London Eye you get an embarrassing fit of vertigo and need to move away from the windows sharpish). It was pretty horrendous weather for the press launch so I can give you worse case scenario. We stopped below the top as it was all white out from about halfway up and paused at lower points instead. In such conditions you’d be offered an alternative day. Meanwhile, as it’s sponsored by British Airways, we got to see some lovely onscreen images of sunny places we might rather be. The first thing you get a good view of is the West Pier so you can get all sad about what might have been if the restorers had got to it before the arsonists. We also briefly got a half decent view towards the Palace Pier. On a good day you should be able to see as far as the South Downs in land. Here are some facts: you get up to 138 metres (450 ft.) and flights last 20 mins by day, 30 mins after 6.00pm. 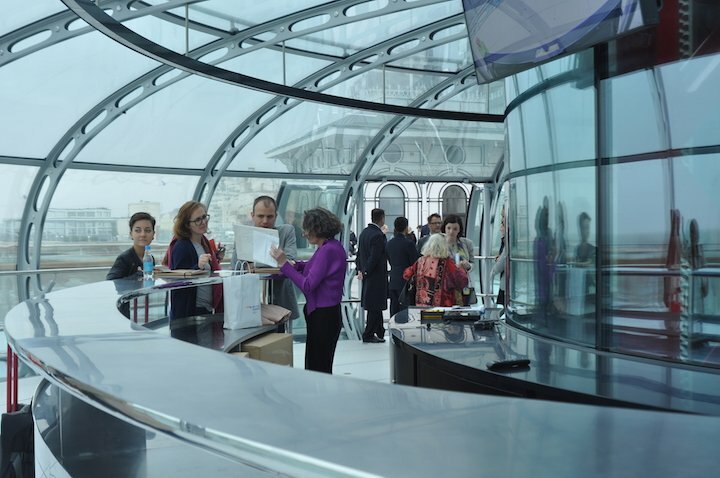 The capsules are ten times bigger than those on the London Eye. 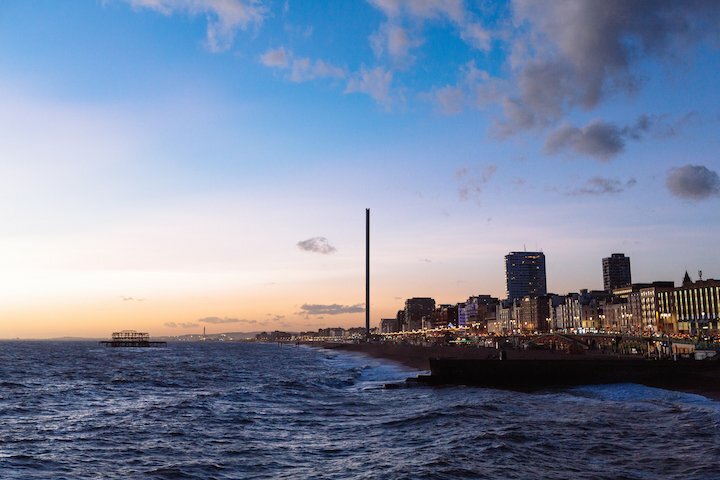 It’s the world’s first ‘vertical cable car’ and it’s in the Guinness Book of Records for ‘world’s most slender tower’. 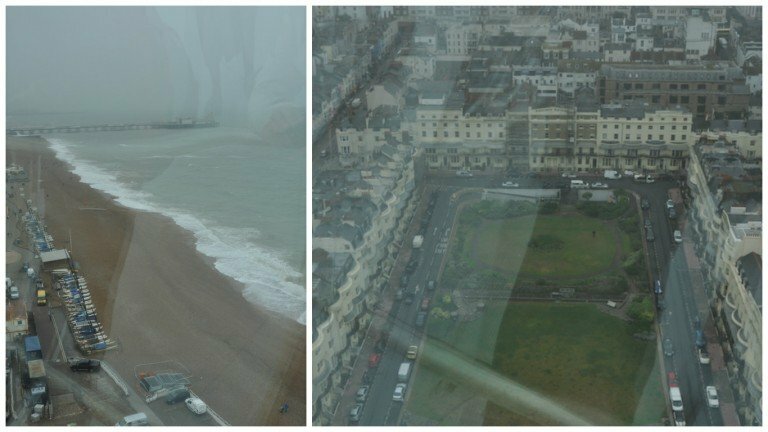 So here’s what I did and didn’t like… I like a lot what they’ve done restoring the Victorian West Pier ticket booths, one of which is now the i360 ticket office, the other soon to be the West Pier Tea Room. 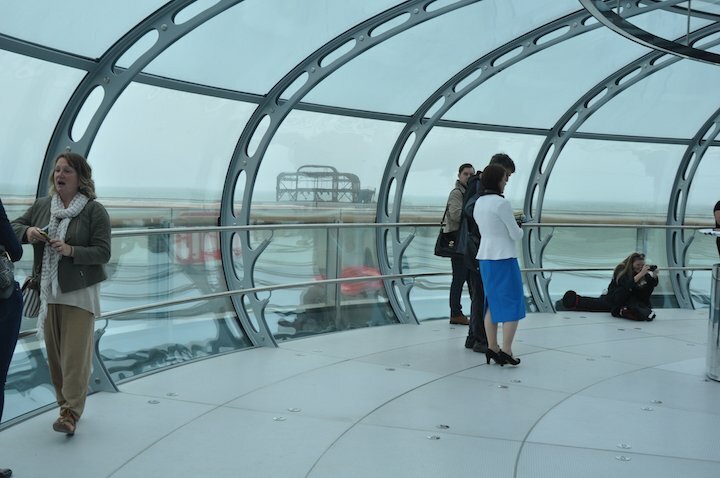 I don’t like that capsule seems a bit small scale compared with the width of the tower and particularly that when the capsule is at the bottom the i360 is basically just a big ugly stick. I like the shiny underneath of the capsules that reflects the ground and also gives a unique view to those left below. I also like that they’re using all Sussex producers for the bar – Nytimber sparkling wine, Brighton Gin, Harvey’s beer etc. and I think the bar and party hire aspect is going to be fun. The Belle Vue restaurant at the base and the West Pier tearoom are due to open later and should be good for making more of a day out of it and for weddings and the like. There’s going to be a free fireworks display soon (currently postponed from launch night due to adverse weather in the lead up) which should be visible from most places on the beach and the tower will also be lit with rainbow colours for Pride this weekend. 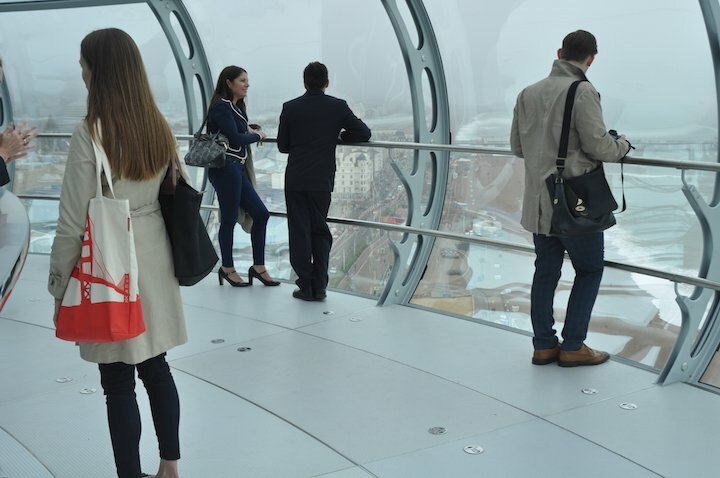 Tickets for the i360 cost from £13.50 for adults, (concessions £11.25), £6.75 for children when booked online at least three days in advance and under fours go free. There are also discounts for advance booking of wine and guidebooks. Residents’ annual membership (BN1, BN2, BN3 and BN41 postcodes) costs £1 and entitles you to £7.50 adults and £5 child tickets at off peak times – that’s anytime Mon to Thurs, before 5.40pm on Fris and before 11.00am weekends.